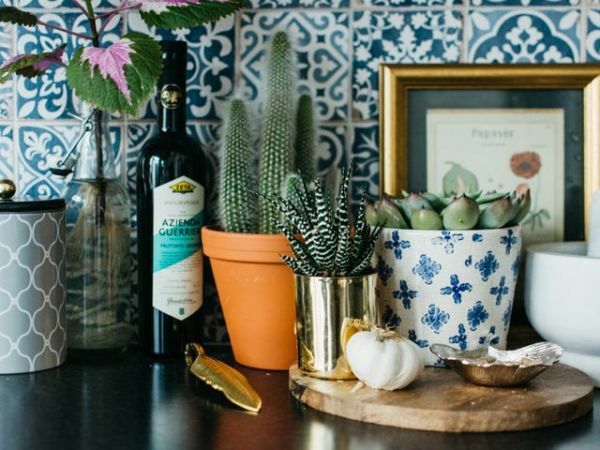 Looking to give your kitchen a dose of down-home charm? Few things capture that aesthetic better than a farmhouse-style approach. To get the look right, here are some of the top signature elements of a farmhouse-style kitchen, reinvented for today. Farmhouse style in today’s kitchen is all about creating the look and the atmosphere of a traditional kitchen found on a family farm, with casually mixed ingredients that add up to a special style recipe with lots of humility and a welcoming attitude. Despite being somewhat modest, these kitchens are also incredibly beautiful, carrying a style that exists entirely outside the trends. Plus, they’re quite functional. Maybe the No. 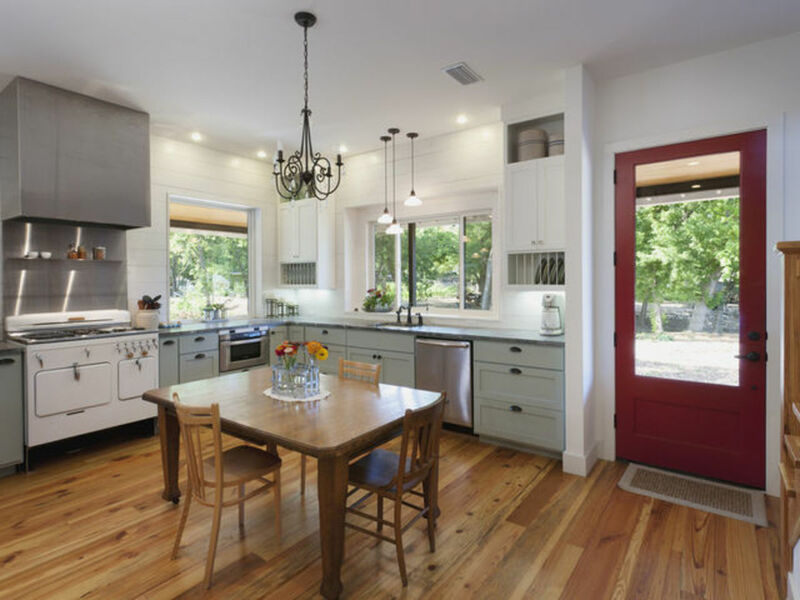 1 defining feature of farmhouse style is the use of freestanding furniture, rather than the typical built-in type of cabinets, islands, and appliances you expect to see in more modern kitchen styles. A furniture-style island, in particular, gives a farmhouse kitchen some of its essential casual appeal. It offers the sense that the room was built over time and has its own personality, rather than having been constructed all at once from a cabinetry catalog. A leggy furniture piece that you can see through also helps the space feel more open, so even the most humbly sized kitchen can feel big enough to do some real home cooking. 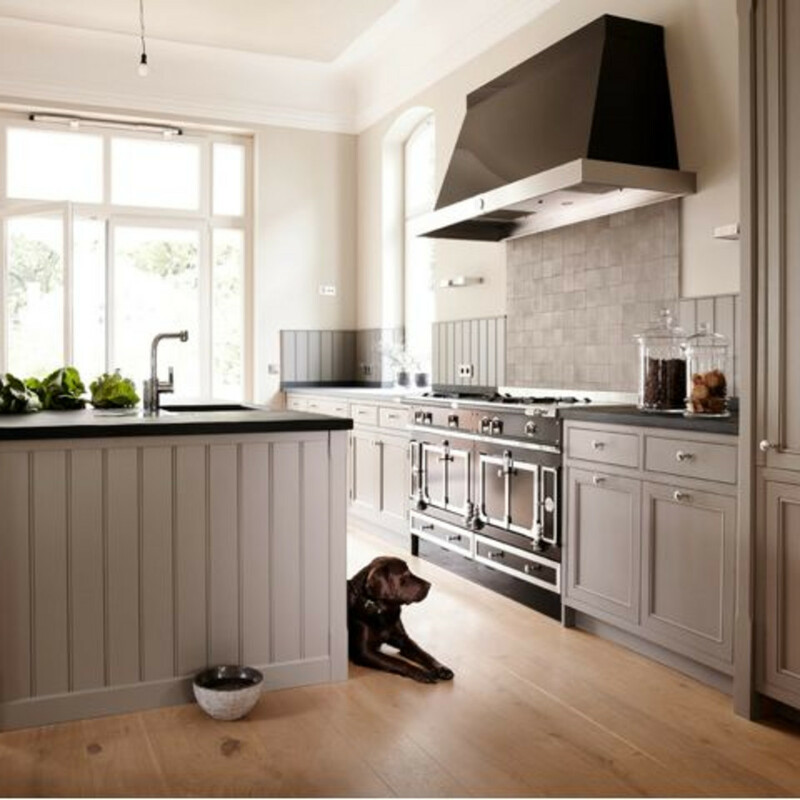 Farmhouse kitchens can come in a range of palettes. 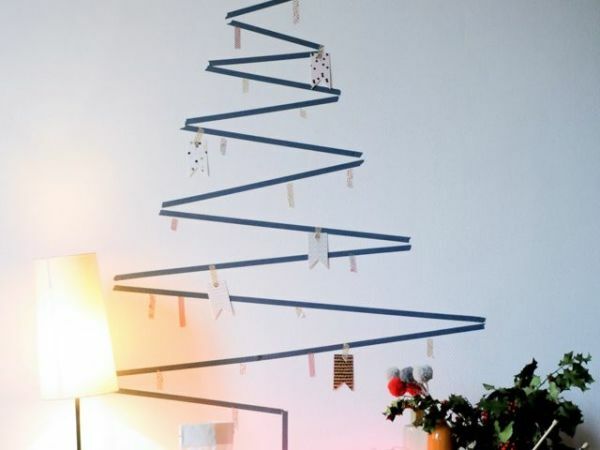 After all, the style is meant to show lots of warmth and personality. 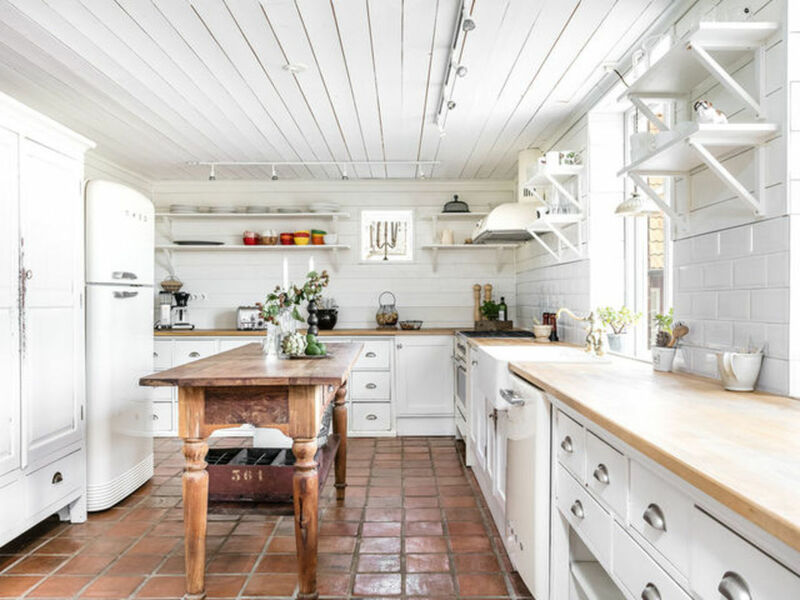 However, a typical farmhouse kitchen draws from colors and materials you would expect to see in an actual country or farm setting, like brick, stone, wood, and soft welcoming hues. When dabbling in bursts of color, look to heritage hues that suit the timeless air of this style, rather than ultra-saturated, trendy hues that can feel too modern. Of course, if you prefer a contemporary take on farmhouse style, then feel free to go wild. In Colonial America, paint mixed with milk was a popular choice for dressing walls and furnishings, and it gave a special, soft matte finish. These days, actual milk paint is often prized for being environmentally friendly, but even when the real thing isn’t being used, the matte finish and muted colors make great inspiration for farmhouse style. Matte finishes give a softer sheen that is friendly to imperfections, but they aren’t always easy to wipe clean, so make sure to choose a “washable matte” or something similar. For a surprisingly happy blue-green hue, try Sherwin-Williams’ Waterscape. 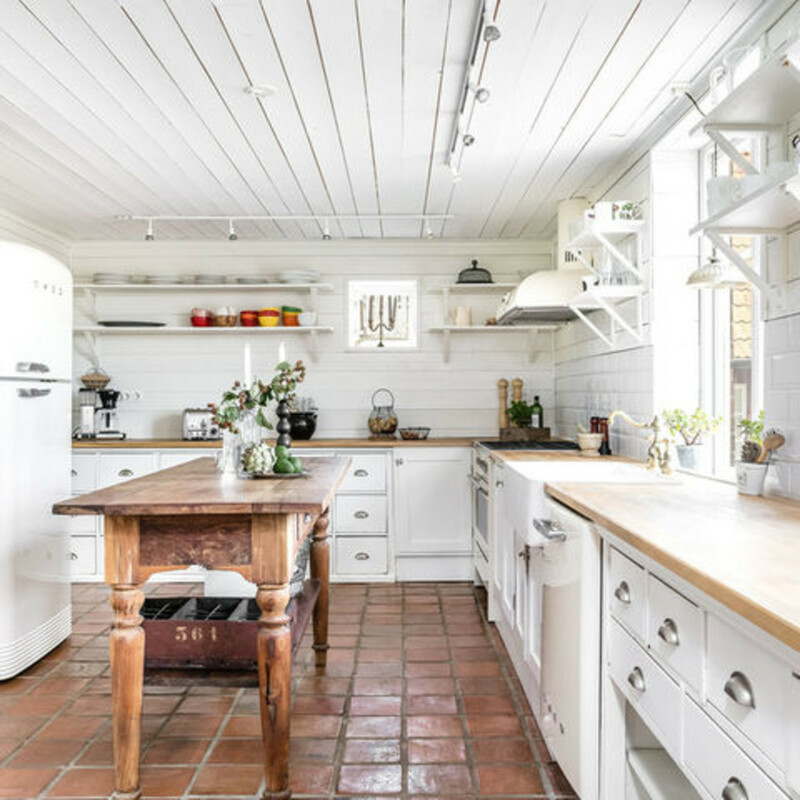 Farmhouse homes are rich with inviting texture, and nothing brings rugged tactility to your walls, floors, and cabinets like beadboard and wood paneling. Whether painted or stained — or clear-coated to show off as much natural grain as possible — the appeal of this simple stripe pattern shines through. Use a looser paneling for a woodsy, cottage-like appeal, or a tighter beadboard for a subtler and more polished take. Many kinds of cabinet hardware can work with farmhouse style, but a top choice is the cup pull, shaped to be perfectly functional and not flashy. You’ll also notice latching pulls on the upper and lower cabinets, which give a historic air and satisfying click when opened and shut. To avoid having fingerprints show on the hardware, use a brushed or antiqued finish. For pleasing sparkle to balance out other matte surfaces, use a polished steel or brass, as long as you’re ready for just a little more upkeep. 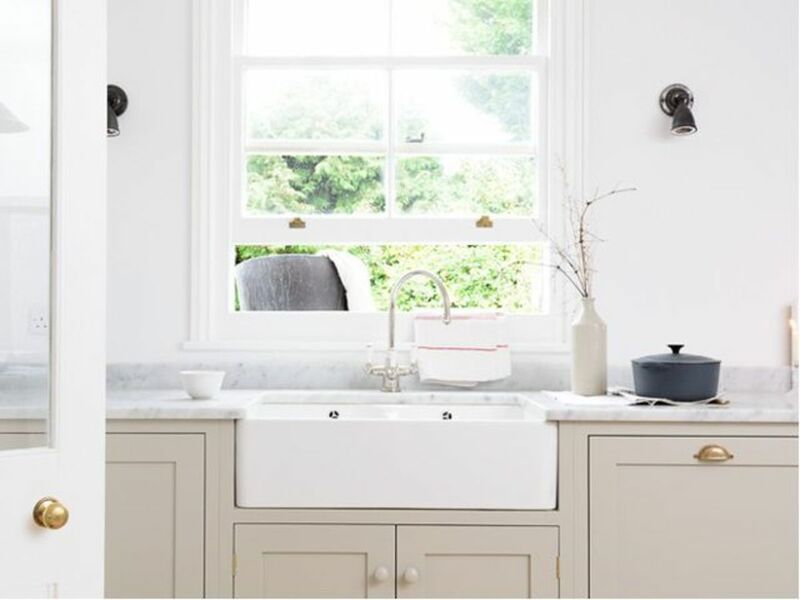 Another small signature of farmhouse style is the apron-front sink. These sinks come in porcelain, steel, stone, and other materials, and they bring this material to the forefront rather than just inside the cabinet. 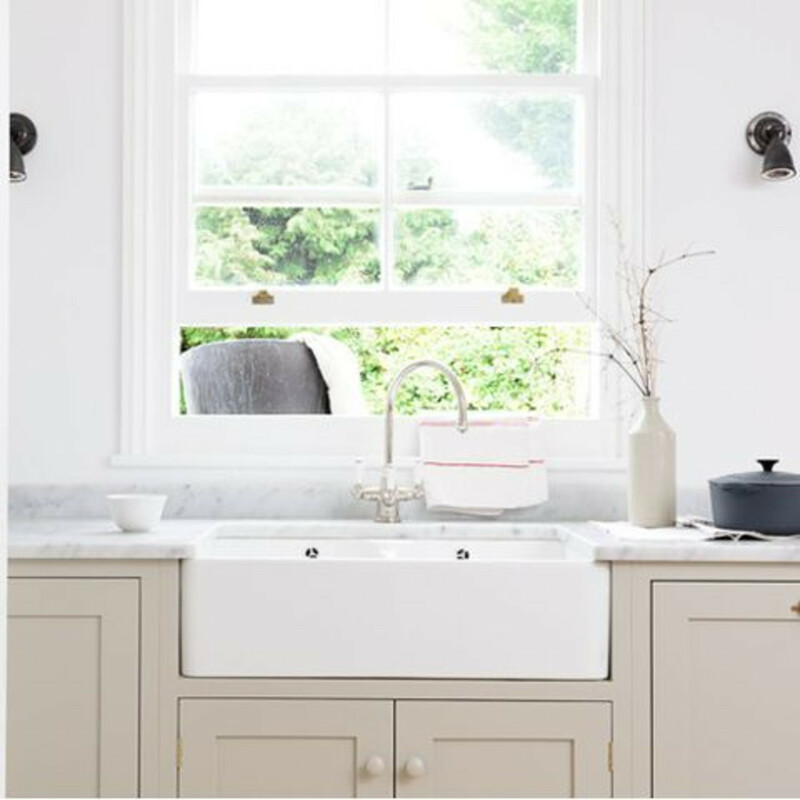 This turns the humble and functional sink into a decorative feature, celebrating the hardworking spirit of true farm homes. 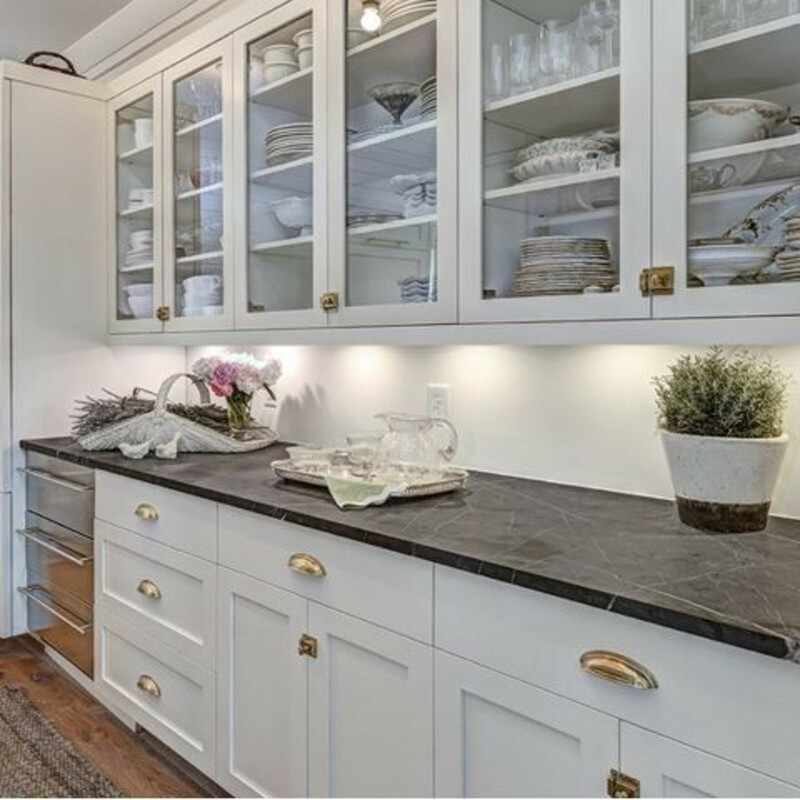 An apron-front sink needs a special type of cabinet to house it, so if you want to include one, make sure to plan for it early in your renovation process. 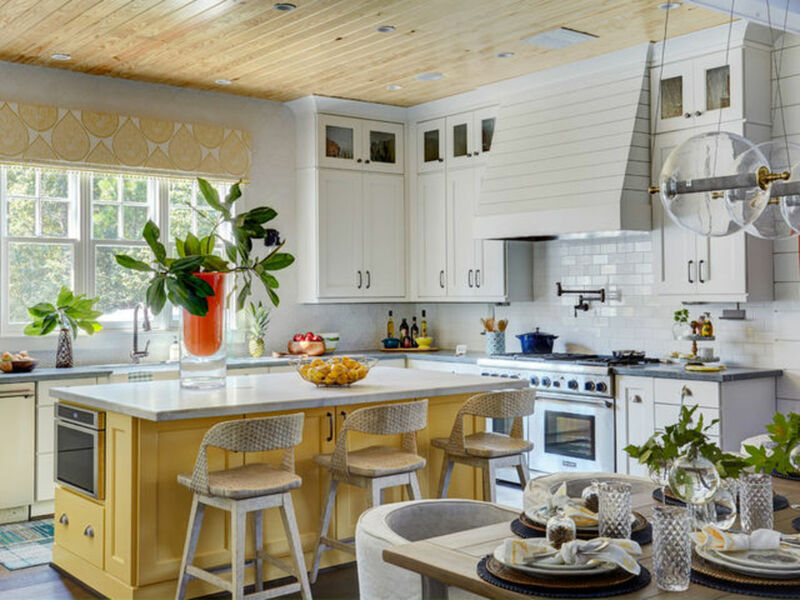 Whether on the floor, the cabinetry, or in little touches like dining stools or a freestanding hutch, warm and inviting wood is practically a must-have in a farmhouse kitchen. 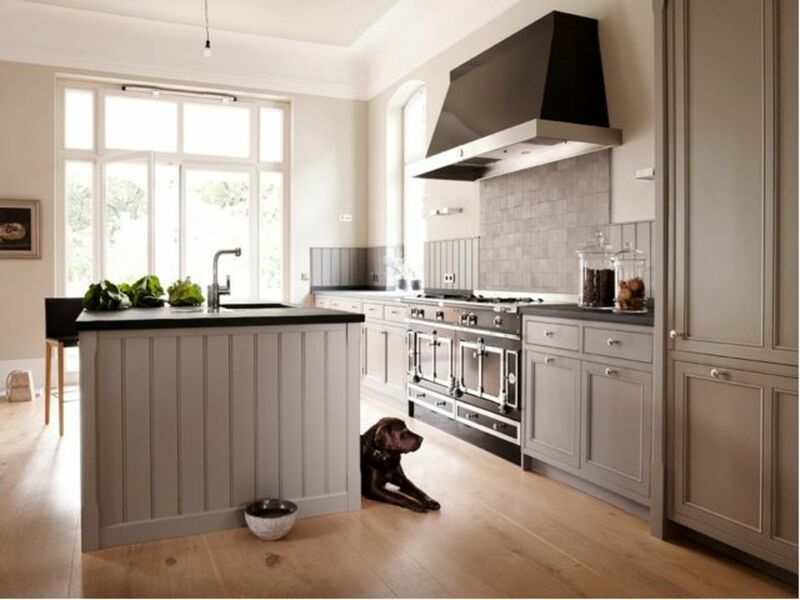 Knotty, local woods add lots of rustic character to ensure that your kitchen is unique yet classic. Look to subtle, slightly red or orange stains to bring out the inviting warmth of the wood and reveal the knots and grain. 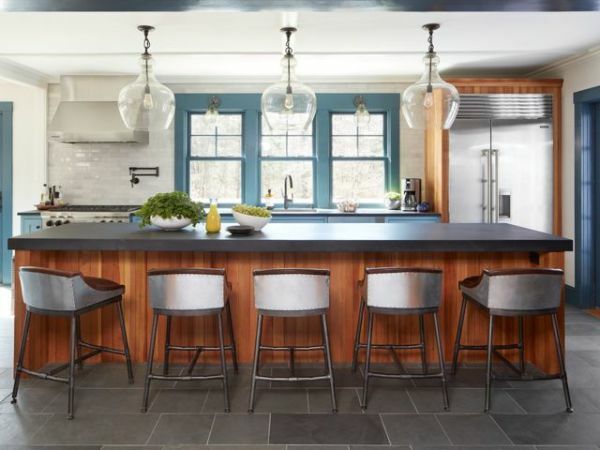 There are few better foils to warm wood than crisp metal — and, of course, true farmhouses contain many a metal pail or tool — so it makes sense to find touches of metal in a farmhouse kitchen. Using too much sleek, polished metal in your space may push the look toward a more modern or transitional sensibility, but don’t be afraid to work with weathered or antiqued metals like galvanized steel, antique brass, or blackened bronze. Add these through light fixtures, storage bins, accessories and brushed-finish appliances. If you’re going to splurge in your farmhouse kitchen, one of the best places to do so is on the oven and other large appliances. If you choose too many typical contemporary models, they may seriously interrupt the timeless look. A generously sized and traditional-looking stove suits such a space beautifully. Although they may feel like a modern trend, open shelves are actually a classic staple that is both beautiful and functional. 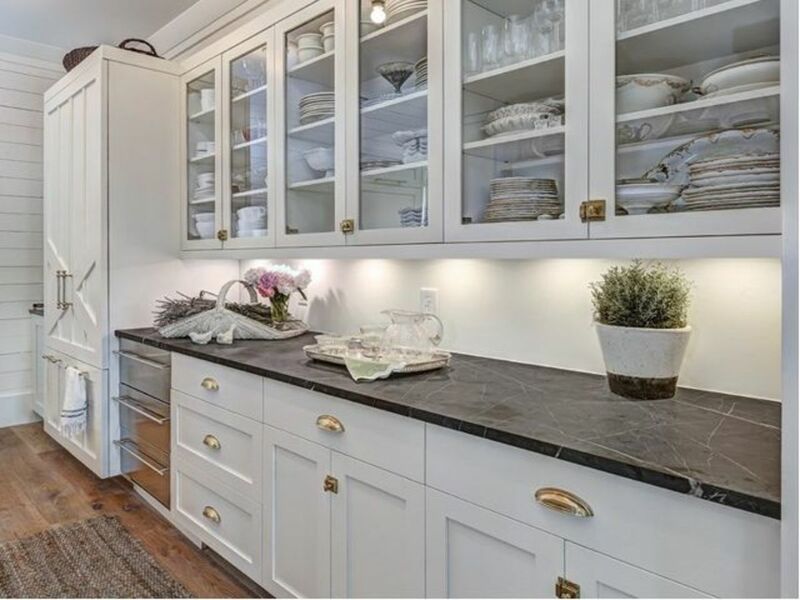 Simple floating shelves, or a hutch or island with an open cabinet, give you a spot to display beautiful everyday essentials like pitchers, glassware, or storage jars, along with collectibles or the “guest china,” so you can still enjoy these items every day even when they aren’t in direct use. Speaking of displaying treasured heirlooms, a farmhouse look benefits from the inclusion of some vintage furniture pieces as well. 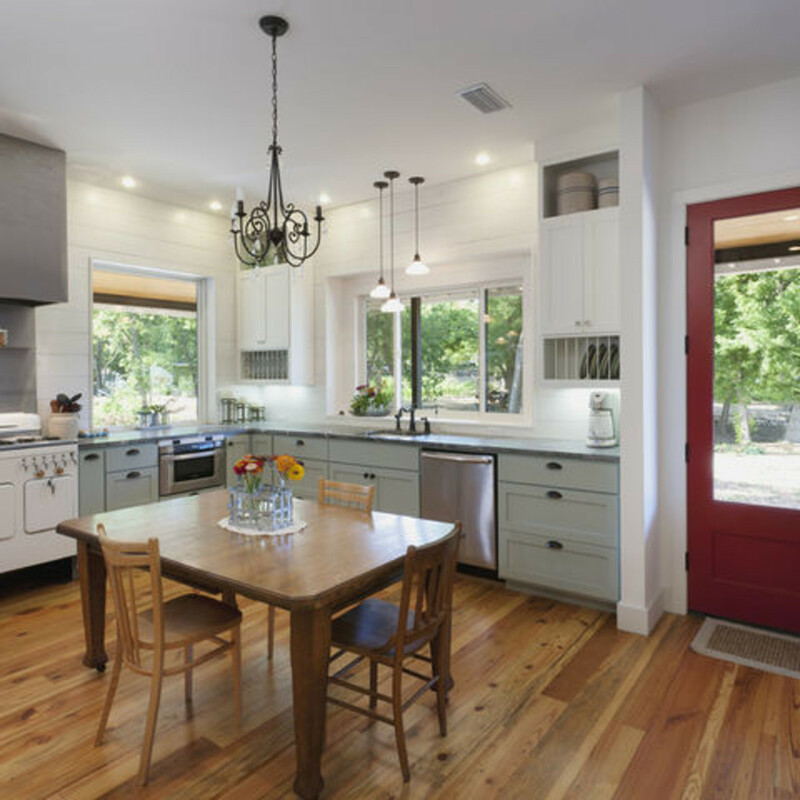 Colorful chairs with worn paint, an antique light fixture, or a well-weathered table bring a sense of history that gives your kitchen a lived-in feel. 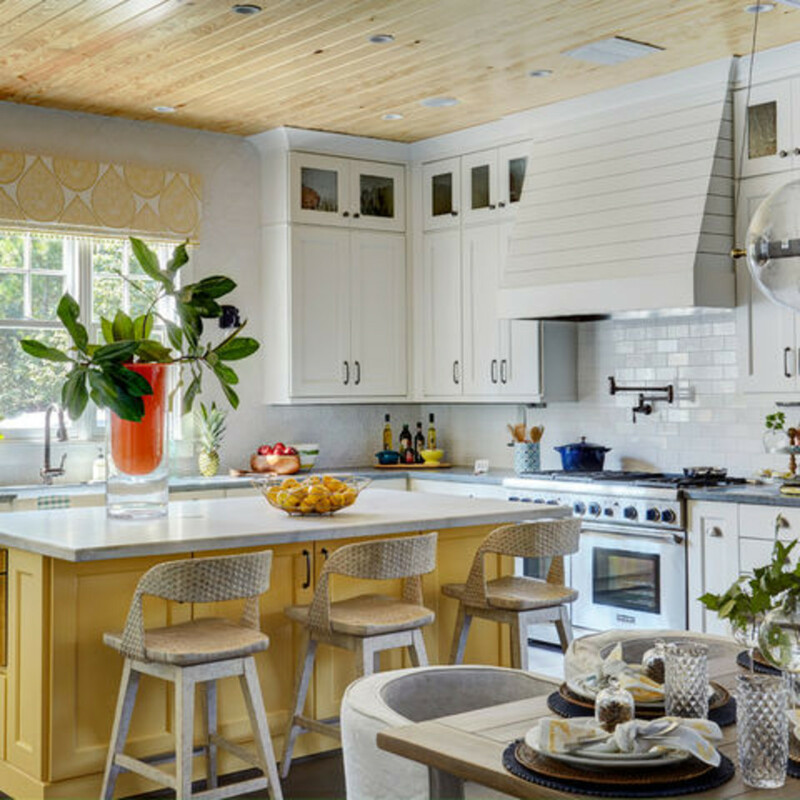 Not every kitchen has room for a full eat-in space, but if you can work in a small table or even a place to dine on your island, it will bring that perfect sense of welcome to complete your farmhouse look. For extra style, mix and match your seating, and let your guests pull up the chair of their choice.